Value pack of knee high support hose for women have wide comfort tops and reinforced toes. 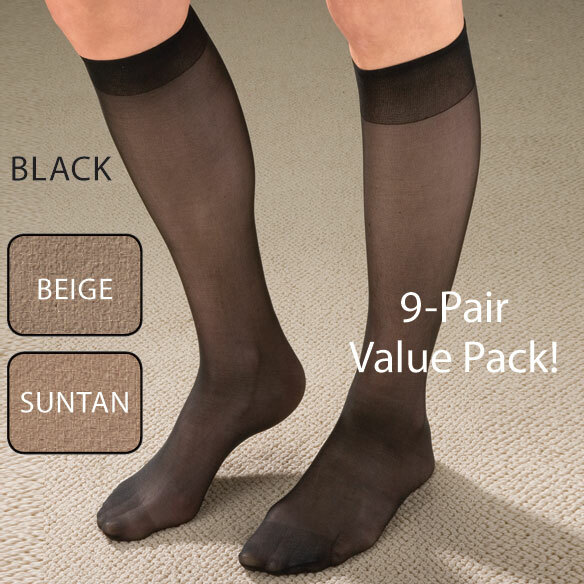 Compression support stockings set includes 3 pair each of beige, suntan and black. Regular fits shoe sizes 6-9 1/2, Queen fits 10-12. Light Support is 90% nylon/10% spandex. Firm Support is 80% nylon/20% spandex. Hand wash. USA. This purchase is perfect for me or anyone who has to wear clean hose every day. The weight is perfect, a quick wash too. Moderate support for lymphedema. Beautiful fit for my very short legs. Not too warm even though temps are high. Do not roll down. Very little tightness at top of stocking. Best fit I have found. wasn't a good fit, maybe needed queen. I wish there was more information on firmest, & sizing. I buy these support knee highs about three times a year. These knee highs do the job they were intended to do, last a long time, are reasonably priced and offer a color assortment to choose from each day. What more could you want?! Thin as opposed to compression knee highs, but at this price a great deal. Wish they would sell also sell a nine pack of just black! These feel great. I haven't yet washed them so I don't know how long they'll last. Didn't really want the brown shades (they're very dark) but I am going to keep them all because they seem so comfy. I was happy with the service. I ordered a pack of three women's support hose. When I opened the package, it contained three different sizes. I loved the merchandize but how do I handle three different sizes? Because they are affordable and they really work for my edema. I am trying these because I could not find the ones I ordered before. Those fit perfect and worked well for big women. In hopes that they will fit more comfortably on my legs. Most tops are too tight. A 9 pack of knee high in black!!! Yes I definitely need these!!! I needed some additional support for swelling feet and ankles but couldn't tolerate compression hose. This is a nice compromise. i'M EXPECTING IT WILL BE GOOD FOR MY WIDE CAKVES AND WILL BE FIRM ALSO. ankles are swelling and Dr. said to get some support hose. I have to wear compression hose every day & I wanted the closed toe knee highs for the winter. wanted moderate support -- firm seemed too much. Wide band at top. Good support. Easy to put on. At my recent Dr's Appt., he recommended that I begin wearing them. Elderly parent needs comfort and appeal in her hosery. this pakage offers just what I need. Three basic colors will cover my wardrobe. If they fit I will be back for more. I chose this because I have always had good quality and price from Easy Comfort. For work on my feet for long periods. Because my doctor recommended that I wear them. Wanted to try this prduct. Great fit for plus size lady! I wear a size 7 l/2 WW and have full caves . Will these hose fit me and if so what size should I purchase What is the compressions number of this product? BEST ANSWER: Thank you for your question. We suggest to order by show size. For a size 7 1/2 that would be a regular. The compression level for these are not big enough to have a rating. We hope this information will be of help to you. What is the measurement of compression on these firm stockings? BEST ANSWER: Thank you for your question. The Regular size – un-stretched is 10 ” toe to top of knee high. Stretched is 18” toe to top. The Queen size - un-stretched is 10 ” toe to top of knee high. Stretched is 20” toe to top. We hope this information will be of help to you. BEST ANSWER: Thank you for your question. Unfortunately these knee highs come in a value pack, and we are unable to change the colors in the pack. We hope this information will be of help to you. Is the light support about a 8-15 & a light hose. what is the compression of these hose in mmHg for the firm and light? BEST ANSWER: Thank you for your question. The compression level is not significant enough to have a rating. We hope this information will be of help to you. i need extra wide calf ? BEST ANSWER: I also need extra wide, they were a little tight around the calfs. The queen size worked well for my extra wide calf. That depends on the width of your calf. my calf is 161/2" . Should I buy regular or queen size? Also, how do I determine which firmness ?. Do you have them rated like compression hose? BEST ANSWER: Thank you for your question. You will want to order by shoe size. The firmness will depend on when you want for support and comfort. We hope this information will be of help to you. Queen size and I wore them on a flight to/ from Europe and the bus trip for three weeks. They were great. I love them. With a shoe size of 9 1/2 what calf circumference would a Queen Light fit? BEST ANSWER: Thank you for your question. The queen when stretch can stretch up to about 17 1/2" calf measurement. We hope this information will be of help to you. Can you get black only. A package with just black stocking only. No other colors in the package ? BEST ANSWER: Thank you for your question. Unfortunately no we do not offer just black. We hope this information will be of help to you. BEST ANSWER: Thank you for your question. Yes this should work well for you. Just look through the size chart and make sure the sizes will fit. We hope this information will be of help to you. what is the compression on this stocking? BEST ANSWER: Thank you for your question. The compression level is not strong enough to offer true support. We hope this information will be of help to you. will these fit a 23 in calf? BEST ANSWER: Thank you for your question. The sizing depends on the show size, Regular fits shoe sizes 6-9 1/2, Queen fits 10-12. We hope this information will be of help to you. Will these fit ankle circumference of 14 in and calf of 21? If so what size should I buy? BEST ANSWER: Thank you for your question. The size is based on shoe size. Regular fits shoe sizes 6 - 9 1/2 and queen fits 10-12. We hope this information will be of help to you.